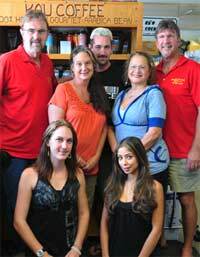 The Hawaiian Moonbeans Coffee Company is a family-run business owned by Tom and Joanne Kosinski. We partner with only best Ka'u Coffee farmers to provide you with both the region's and island's premier coffee. Our retail outlet, the Kahuku Country Market, is staffed by local residents who all work together to provide the quality products and service we're known for. Our farmers include Tom Kosinski, Simon Wooley, and Frank. (from left to right) Tom, Jenna, Joanne, Chad, Monae, Rhoberta and Eddie. Tom is not only the owner and Roast Master but a coffee farmer himself. For almost twenty years, he's been on a quest to create the perfect cup of coffee. It was during this time he realized the importance of ensuring the highest of quality and standards at every stage of the production process. This led to Tom to purchase his own roasting equipment and to become a professionally trained Roast Master. Tom is a member in good standing of the Specialty Coffee Association of America and The Roasters Guild. 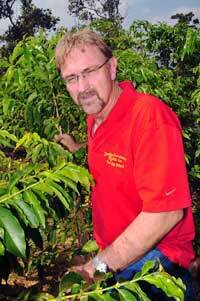 Tom plays an active role in the local community to support Ka'u farming and promote its burgeoning coffee industry. He earned a B.S. degree in Agricultural Business Management at Cal Poly San Luis Obispo, proudly served in the US Army and is a member of the Veterans of Foreign Wars. Simon is one of our Ka'u Coffee farmers. Even before setting foot on Simon's farm, you can tell from a distance why his coffee beans are larger and more flavorful than Kona beans. The acres of rich soil left over from decades of sugar cane farming are of sharp contrast to the shallow layer of soil over solid rock found on most Kona farms. The quality of his farm's beans are unmatched on the island. 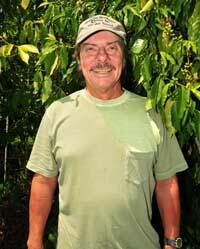 Frank brings to Hawaiian Moonbeans Coffee his decades of experience from growing coffee on his own farm in Kona. 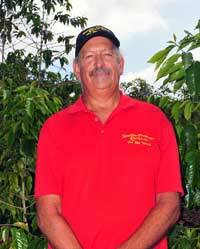 He brings the knowledge and practices of the established Kona growing region to Ka'u. Frank helped our Ka'u farmers plant and cultivate some of the best crops on the island. While our focus is on Ka'u coffee, we acknowledge the amazing taste of coffee grown throughout the island and are proud to offer Frank's coffee alongside our main label.